OB Lifeguard station - built late 1960s. OCEAN BEACH, CA. Every now and then, an Ocean Beach organization takes one of the community’s problems head-on. This is happening with the old OB lifeguard station and its public restroom facilities. Recently, the OB Rag complained about the state of the restrooms. For comparison: Lifeguard station at Pacific Beach. Stepping up to the problems, the OB Town Council has “adopted” the public building – built sometime in the late Sixties – and plans to shepherd through some improvements with the facility. I spoke with Jim Musgrove, the OB Town Council president the other day. He informed me that his Board was taking the lifeguard building under its wing. He acknowledged that the City of San Diego has no money to completely replace the aging building, even though OB was promised a new one a few years back. 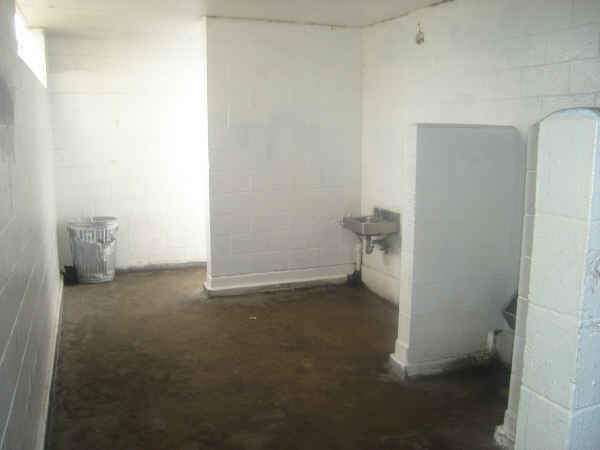 Men's room, public restrooms at OB lifeguard station. The Council is working with the City, however, to ensure that it is safe. They have hooked up with the lifeguards, the Park and Rec Department, Councilmember Kevin Faulconer’s office and the OB Mainstreet Association, and together they have been having discussions on the improvements for the last year. A local architect, Steven Lombardi, has offered his services and is drawing up changes to improve the building and deal with certain safety issues. locking the restrooms themselves – as there have been problems with people sleeping in them. Most of these ideas sound great. I told Jim, however, he might have problems with the community agreeing to locking up the restrooms at night. “People use them at all hours,” I said. Not too shabby: individual public restroom at Skateboard Park in Robb Field. It even has a fold-down changing table. “What about seating inside?” I asked Jim. He wasn’t certain about that as space is narrow. 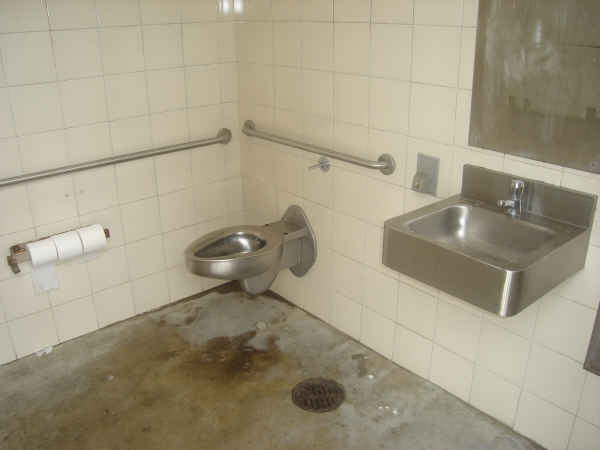 He did say they’d like to see the restrooms more ADA compliant and accessible. There’s state and Federal monies for improvements like that. “What about the showers?” There’s no changes being discussed for them. One of the Council Board members, Larry Wasserman, has offered to be the point of contact for these improvements. Women's restroom, near PB lifeguard station. This is great, that the town council has taken this on. At times, it appears that OB consumes itself in beer bashes and musical shindigs, while its infrastructure crumbles and even closes down. We welcome the OB Town Council stepping up to the problems of our lifeguard station and its public restrooms. Meanwhile, in our quest for guidance on the issue of the conditions of our public restrooms, we examined briefly the new public restrooms at Robb Field’s Skateboard Park. 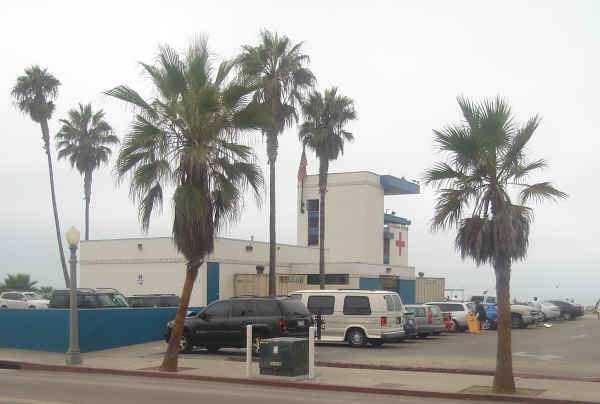 Finally, for comparison, we visited the Pacific Beach lifeguard station and the restrooms nearby. 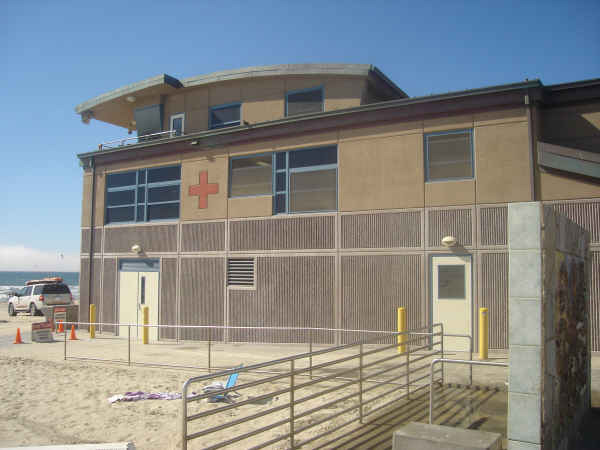 Envious of their newer lifeguard tower, the public restrooms were not a huge upgrade from OB’s. More on all of this later ……. this is good that the town council is doing this. but do not, repeat, do not lock the restrooms! too many good people use them at all hours. surfers in the early hours, late-night revelers in the wee hours. okay, so homeless take advantage of it. so what? it’s so wet in there all the time, anyhow. it’s not much of an advantage from the elements. oh, another thing: do not lock the restrooms. and by the way, did i say don’t bolt the door to the restrooms? Thanks OB Rag for another good story. We need MORE public restrooms in San Diego, not fewer. 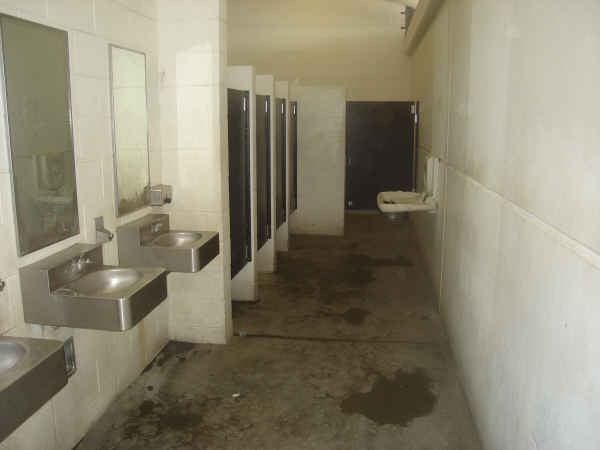 Additionally, more public showers, inside public restroom areas, not merely outside for sand & rinsing. Everyone has a right to a bathroom, and a clean place to bathe. Mosaics and murals??? How about something practical like skylights to deal with the perpetual dampness in the South OB restrooms? It was bad design to put the restrooms on the dark side of the building IMHO. P.S. The building only dates to the early eighties, not the late sixties. Larry OB – you’re in the minority Larry on this one – the date when the current lifeguard station was built. I’ve been asking around, and for instance,everyone at the OBMA office the other day agreed it was built in the mid to late sixties. If you check out Gallery 2, pictures 051, 052, 053 & 058 from oceanbeachphotos.com you can see a lifeguard tower that was there in ’68 and ’70 respectively. Not sure if that’s the same building because it does look different. Dave, you’re right, if Steve’s memory for the 1970 photos is correct. So, the current lifeguard station was not built in the mid or late Sixties, according to Rossell’s images that show the old station circa 1970. I’m actually in photo #40 – right front foreground – hey I was all of 20 years old, freshly married and going to UCSD, living on Brighton. But will the OBTC (or any other civic org) stand up when the issue of condos at the foot of Sara comes up? Didn’t want to leave my full name for safety reasons. I see mega issues with this restroom. The metal toilets need to go. There needs to be fresh tiles placed on the concrete and paint on the walls. Ceramic toilets and sinks should replace the steel with either automatic or lever flush valves. I say this because when you use a public restroom especially when you plan to shower, you want to feel like you’re in a safe, clean, user friendly environment. And this, while it might be safe is the farthest thing from clean and user friendly.